Blog photos – Are you sure that’s legal? I’ve been reading a few articles about the legality of using photos on blogs. Two posts in particular caught my eye today – Bloggers Beware: You CAN Get Sued For Using Pics on Your Blog – My Story by Roni Loren, who talks about the issues that surround taking images from the internet to use on your blog posts. Most bloggers/social media folk use images from the internet without giving much thought to where they come from or who owns them. I’m one of them. I figured if I search for something in Google Images, I can save it and use it to illustrate a blog post topic. Turns out that someone somewhere owns that image, and I’m leaving myself open to being sued for using it without permission or paying for it. I always figured that if it’s in the public domain it was free to use. Now I’m not so sure. I can understand that when a photographer takes a load of pictures, let’s say for a family portrait, then he own those images and sells prints to said family. That way the photographer continues to earn a crust and the family can request addition prints later on. After all, the original piece of work remains the property of the creator, be that photo, video, sculpture, writing etc, unless some sort of contract is agreed to whereby the artist has relinquished all right to that creation. The second post that grabbed my attention was WANA Commons–Beautiful Blog Images without the Worry by social media Jedi Kristen Lamb. She has set up a Flickr Group called WANA Commons – WANA standing for We Are Not Alone – and designed for bloggers to share their photographs. Share your photos How To Guide. All you need to do is set up a Flickr account, don’t worry it’s free and easy-peasy lemon squeezy. As you can see I’ve added the tags to a photo of my dog, Ben. 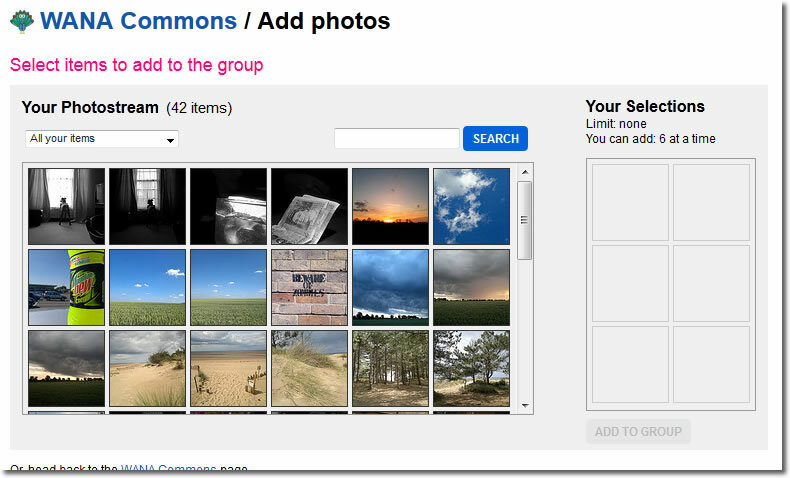 If you want to share your photographs with a group like WANA Commons, add the tag WANACOMMONS and your name. Click EDIT next to the Create Commons Licence, if you’re not sure what options to use visit the Creative Commons website and learn what’s best for you. There’s also a UK based Creative Commons website. Creative Commons is a non-profit organisation that assists authors and creators who want to voluntarily share their work, by providing free copyright licences and tools, so that others may take full and legal advantage of the Internet’s unprecedented wealth of science, knowledge and culture. When you get to the group just click the ADD PHOTOS button. And here you’ll be given a simple boxy thing where you click the photos you have already uploaded to your Flickr account. You can only click 6 at a time, so be patient if you have lots you want to share with the group. So these are the photos in my account. I clicked 6 on each row and the appeared in the box on the right. 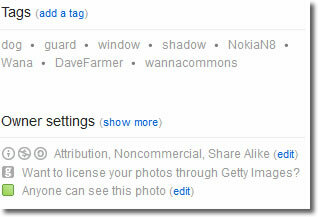 Then click Add To Group and hey-presto you’re sharing your photos with the group. Because it’s all about creating a community where people can share their media to use on their blogs. You could visit a paid site where you can buy photo’s, and sometimes that’s a very good option if you’re looking for a more professional look for your project or simply want a wider variety of images to choose from. There are plenty of sites that have plenty of options like royalty free images, subscription based services where you can use a certain number each month and so on. Whether you pay to use images or not I think it’s good practice to give credit to an image. WANA Commons is an excellent way to share your photos with other bloggers and writers without worrying about the legality of using something without permission. I’m more than happy to let someone use my images so long as they give credit, a simple bit of text under the photo stating my name, or at the end of the article, is more than sufficient. Sadly I’m well aware of being hypocritical here as I seldom remember to add a name or link to images I use on my blog. But that is going to change. From now on I’ll make every effort to ensure any image I use is done correctly and provide a name and link for the original owner. 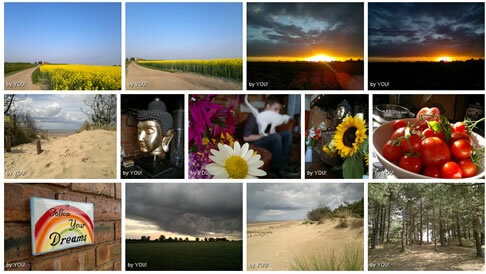 Do you have any thoughts on using images you use taken from the net? How to add an image widget to your side bar! That’s not Racism you morons! ← The Hunger Games – Don’t bash it until you understand it. Great post Dave! I’ve typed in “Free images” on google search before now only to find they are NOT free. I don’t mind people using my pics if they like, all I ask is that they give credit. Some of these FREE image sites can be misleading as they offer a small selection of free images but then sort of lure you in to buying, and often the price is quite small for one or two images, but it all adds up. Pingbacks can be annoying at times, but that seems in poor taste to me PiP. I’m all in favour of a reblog, but not when the information is being passed off as your own and in great abundance either. In case you are not aware, the term “public domain” actually refers to a work (movie, music, photo, story, etc.) where the copyright has expired (or never existed) and is now free for public use. Just because an image is found via Google or out there in the interwebbies does not mean it is ‘public domain’. Bloggers have been lucky there haven’t been more lawsuits because of the misconception that “I found it on Google it must be public domain.” Not sure if it has changed but copyright(s) used to expire after 100 years if not renewed by the copyright owners. It used to be less time but Disney, I believe, worked to extended the length of copyright to protect their movies and images (in the 1980s I think). This is simplified, of course, since copyright is actually rather complicated. Most don’t understand all the intricacies involved and, even with a limited understanding, tend to ignore it. Hence the existence of high paid copyright lawyers! Thanks for that! I admit I wasn’t sure what public domain really meant. I’d heard of the expiry thingy of a 100 years before but had no idea it led to public domain. I suspect a significant amount of average web users have no idea of the copyright issues that surround using images and media online. When you have an entire generation of young Facebookers, Tweeters etc, who copy and paste images with such regularity, it’s often easy to see how copyright law isn’t taken seriously or misunderstood. It’s in interesting area for sure. Reckon I’ll spend some time reading up on this. There must be an Idiots Guide or Dummies book on the subject. Great post Dave, and much needed, because it would seem the majority of us don’t take this as seriously as we should. 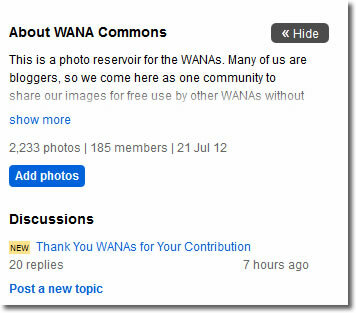 The WANA Commons on Flickr is a great idea for our own safety, so thanks for the heads up. Going over there now. I think, in Canada, copyright expires 50 years after the death of an author. People seem to feel free to use images from wherever without even the courtesy of naming the source. I find this is especially so on FB and true of paintings etc as well as photography. Always err on the side of caution, I say. i use dreamstime as a site for free images, they also sell images at reasonable prices and I’ve used those as well in my work, for instance on the cover of my book. always with giving credit. I ask myself, would I want a picture of mine to be used by all and sundry without request and/or without credit given? No of course not. So, why would I do that to some else?